Episode 5 of Inside BU Hockey features Bernie Corbett’s interviews with Coach David Quinn, sophomore center Danny O’Regan and BU Hall of Fame goalie Jack Ferriera. 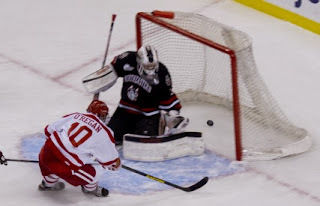 O’Regan (photo credit Michelle Jay), whose father captained the 1982-83 Terriers and played in the NHL, led BU in scoring as a freshman—the first to do so since Tony Amonte in 1989-90. He earned Hockey East co-player of the week honors this past weekend. Rhode Island native Ferreira assumed the netminding duties in 1963-64, Jack Kelley’s second squad, earning All-New England honors. As a junior he set the BU record for shutouts in a season—eight—and was named All-American. He backboned the Terriers to their first NCAA appearance in six years, while increasing his career shutout mark to 13. After some coaching stints, Ferreira moved into pro hockey front office positions. He became the first general manager of the San Jose Sharks and later filled the same spot for the Anaheim Ducks. He was assistant GM for the gold-medal winning US team in the 1996 World Cup of Hockey. Currently, he is the Special Assistant to the General Manager of the Los Angeles Kings. Last season’s captain, Wade Megan, was named ECHL player of the week after producing six goals and three assists—and was +6— to help the Cincinnati Cyclones sweep three games. The Canton, N.Y. native and Florida Panthers fifth round draft pick in 2009, leads ECHL rookies with six goals and 12 points, and is second among first-year players in plus-minus at +10. Last week we posted about Nick Bonino's return to Agganis Arena with the Anaheim Ducks and the fortuitous timing that put him in the stands at Fenway Park for the Red Sox' series clincher. Fox Sports West has documented "Nick's excellent adventure." Terriers are back on the ice for the fourth time in nine days taking on Connecticut at Walter Brown Arena tonight at 7 p.m. BU will seek to improve to 4-0-0 in Hockey East. There are five Terriers among the 27 skaters on the Team Canada’s roster for the Four Nations tournament now underway at Lake Placid, NY. Current Terrier Marie-Philip Poulin and former teammates Jenelle Kohanchuk, Jennifer Wakefield, Tara Watchorn and Catherine Ward face off against Team USA tonight.